Crackle... hiss... rumble... click... pop... hum... When it comes to audio, it can be a filthy mess out there. So Bias announce SoundSoap Pro, a new high-end audio restoration solution for Mac OS X as a companion to its existing SoundSoap, featuring multiband noise reduction; click, crackle & hum removal; plus noise gate - all integrated into a single RTAS, AU or VST plug-in. 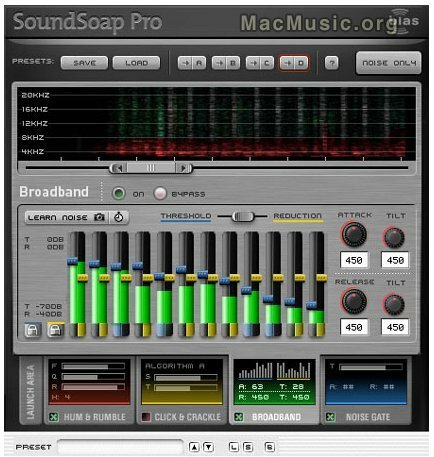 SoundSoap Pro will be available Q1 2004 for a retail price of EUR599. Aug 8, 2012 BIAS don't talk Anymore? Mar 7, 2008 Peak Pro 6 is here !